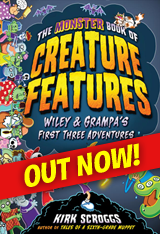 This utterly absurd, wacky and weird compilation of the first three books in the Wiley & Grampa’s Creature Features series is packed with monsters, mayhem, and pictures on every page! 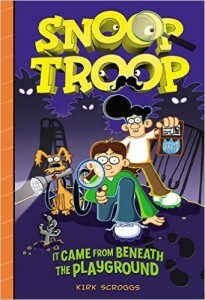 In the rip-roaring adventures, Wiley and goofy Grampa get mixed up with everything from vampires to zombies to a legendary sea monster and always manage to land in deep doodoo. 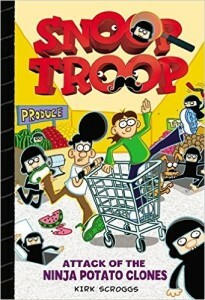 Luckly, they have no-nonsense Gramma and a troop of neighborhood friends to swoop in and save the day! 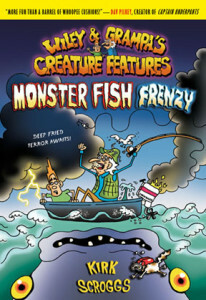 At over three hundred pages, this volume includes fan favorites Dracula vs. Grampa at the Monster Truck Spectacular, Grampa’s Zombie BBQ, and Monster Fish Frenzy. What do you call a grandpa who drags his grandson to a monster truck show in the middle of a tornado? AWESOME, that’s what! 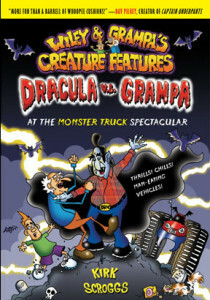 My name’s Wiley and that’s my Grampa and this is the story of how we braved lightning, hail, and an angry Gramma just to see Colonel Dracula’s ultimate vampire truck, The Mudsucker! 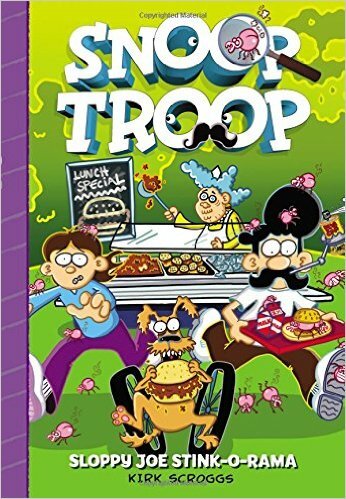 You’ll cringe at the Tarantula Burger, you’ll tremble in Drac’s underground lair, and when Gramma catches us you’ll . . .
Oh, and did I mention the giant mechanical lobsters? My name’s Wiley and this is the story of how Grampa and I set out to capture Moby Fizz, the biggest, most bloated bass the world has ever known! 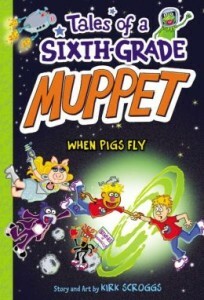 You’ll cry when Moby Fizz swallows Grampa’s beloved stuffed Froggy. You’ll shake in your boots when Grampa does the hula dance. And when Gramma whips out her homemade pimento & cheese you’ll… AAAAAAAAAAAHHH! 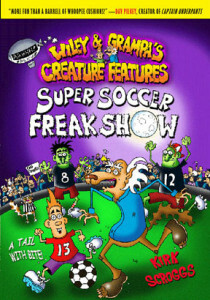 My name’s Wiley and this is the story of how my Grampa turned into a snarling wereyote (that’s half man/ half coyote) at my soccer game against the monstrous Carpathian Coyotes. You’ll howl when Grampa puts the smackdown on their mangy team mascot. You’ll freak out when he ransacks all of Gingham County. And when you find out what’s really in Nate Farkle’s jelly donuts you’ll…. AAAAAAHHHH!!! 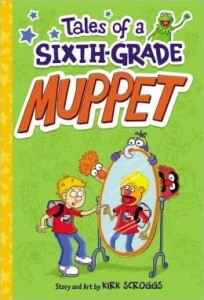 My name’s Wiley and that’s Grampa and this is the true story of how we dragged Gramma, Merle and my best friend, Jubal through the wilds of Gingham County and came face to face with the notorious Bigfoot! You’ll be awestruck as Grampa eats a tangy squirrel kebab. Your heart will palpitate when we ride Gramma down the rapids. 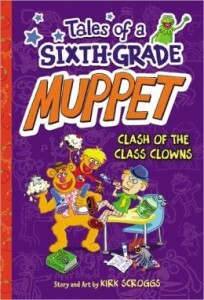 And when the shady Spudmaster Maximus shows up with an army of creepy children you’ll…. AAAAAHHH! 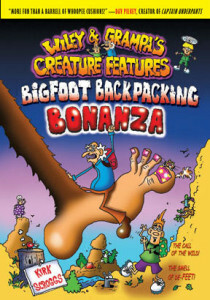 Unearth the stinky truth about Bigfoot when you read Bigfoot Backpacking Bonanza ! What’s an alien’s favorite food? Wiley Con Queso and Grampa Pot pies, of course! My name’s Wiley and that’s my Grampa and ever since a giant meteor hit Gingham County, we’ve been battling evil alien hairdressers, an army of brainwashed grannies, and the biggest threat to humanity as we know it — my own Gramma! You’re hair will stand on end as we save the town from a meteor shower. You’ll go gray at the sight of Gramma’s deadly hair tentacles. 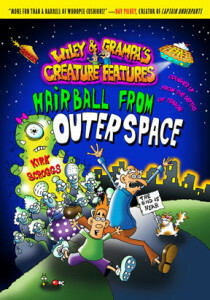 And when we add alien slime to one of Merle’s hairballs you’ll… AAAAAAAAAAAAHHHHH!!!!!! 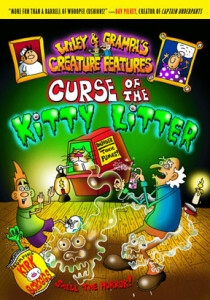 Get set for a brush with hair raising horror! My name’s Wiley and this is the true story of how Grampa and I battled a carton of rancid eggnog that bubbled to life and flooded Gingham County with rivers of milky, shape-shifting goo. You’ll shake like a bowl full of jelly when the eggy menace morphs into Merle. 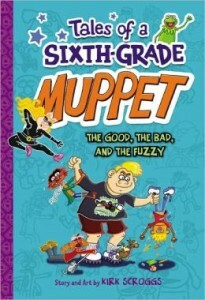 Your insides will curdle when you meet dreaded the fruitcake monster. 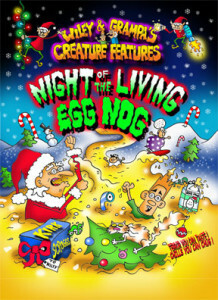 And when Santa’s second cousin, Roberto Claus, unleashes his army of eerie elves you’ll… AAAAAAH! 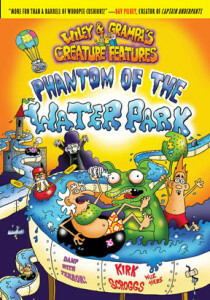 My name’s Wiley and that’s my Grampa and this is the story of how we beat the summer heat at the world’s freakiest water park, Castle Waterhösen. Watch how our relaxing vacation turned into monster mayhem. You’ll shiver in your swimsuits when giant, robot sharks chase us down Hammerhead Mountain. You’ll drop your corn dogs when the diabolical phantom turns humans into crawdads. And when Merle, the cat, does martial arts on a river of nacho cheese you’ll… AAAAAAH! So grab your boogie boards and put on your sunscreen and prepare yourselves for Wiley & Grampa’s WET ‘N’ WEIRD EXTRAVAGANZA! 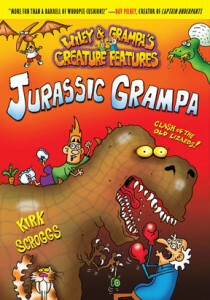 Open your minds and your nostrils for the next Wiley & Grampa’s CREATURE FEATURE! Grab some Pork Cracklins and some lizard repellant and prepare yourselves for Wiley & Grampa’s next prehysterical CREATURE FEATURE! ©2013 by Kirk Scroggs, LLC. All rights reserved.